^ a b c Weijerman, ME; de Winter, JP (Dec 2010). “Clinical practice. The care of children with Down syndrome.”. European journal of pediatrics 169 (12): 1445–52. doi:10.1007/s00431-010-1253-0. PMC: 2962780. PMID 20632187. https://www.ncbi.nlm.nih.gov/pmc/articles/PMC2962780/. ^ a b c Malt, EA; Dahl, RC; Haugsand, TM; Ulvestad, IH; Emilsen, NM; Hansen, B; Cardenas, YE; Skøld, RO et al. (Feb 5, 2013). “Health and disease in adults with Down syndrome.”. Tidsskrift for den Norske laegeforening : tidsskrift for praktisk medicin, ny raekke 133 (3): 290–4. doi:10.4045/tidsskr.12.0390. PMID 23381164. ^ Roizen, NJ; Patterson, D (April 2003). “Down's syndrome”. Lancet 361 (9365): 1281–89. doi:10.1016/S0140-6736(03)12987-X. PMID 12699967. ^ ACOG Committee on Practice, Bulletins (Jan 2007). “ACOG Practice Bulletin No. 77: screening for fetal chromosomal abnormalities.”. Obstetrics and gynecology 109 (1): 217–27. doi:10.1097/00006250-200701000-00054. PMID 17197615. ^ Mersy, E; Smits, LJ; van Winden, LA; de Die-Smulders, CE; South-East Netherlands NIPT, Consortium; Paulussen, AD; Macville, MV; Coumans, AB; Frints, SG (Jul–Aug 2013). “Noninvasive detection of fetal trisomy 21: systematic review and report of quality and outcomes of diagnostic accuracy studies performed between 1997 and 2012.”. Human reproduction update 19 (4): 318–29. doi:10.1093/humupd/dmt001. PMID 23396607. ^ Bianchi, DW; Parker, RL; Wentworth, J; Madankumar, R; Saffer, C; Das, AF; Craig, JA; Chudova, DI; Devers, PL; Jones, KW; Oliver, K; Rava, RP; Sehnert, AJ; CARE Study, Group (Feb 27, 2014). “DNA sequencing versus standard prenatal aneuploidy screening.”. The New England Journal of Medicine 370 (9): 799–808. doi:10.1056/nejmoa1311037. PMID 24571752. ^ Green, RM (1997). “Parental autonomy and the obligation not to harm one's child genetically”. J Law Med Ethics 25 (1): 5–15. doi:10.1111/j.1748-720X.1997.tb01389.x. PMID 11066476. ^ Glover NM and Glover SJ (1996). “Ethical and legal issues regarding selective abortion of fetuses with Down syndrome”. Ment. Retard. 34 (4): 207–14. PMID 8828339. ^ Will, George (2005-04-01). “Eugenics By Abortion: Is perfection an entitlement?”. Washington Post: A37. http://www.washingtonpost.com/wp-dyn/articles/A51671-2005Apr13.html. ^ Morris, JK; Mutton, DE; Alberman, E (2002). 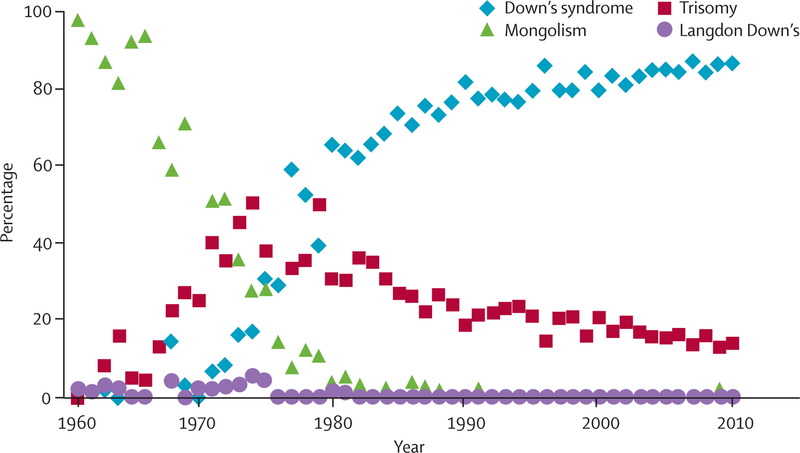 “Revised estimates of the maternal age specific live birth prevalence of Down's syndrome.”. Journal of medical screening 9 (1): 2–6. PMID 11943789. ^ “Maternal age specific risk rate estimates for Down syndrome among live births in whites and other races from Ohio and metropolitan Atlanta, 1970-1989”. J. Med. Genet. 35 (6): 482–90. (1998). PMC: 1051343. PMID 9643290. https://www.ncbi.nlm.nih.gov/pmc/articles/PMC1051343/.